This fence is a hard wood fence that can have up to 3 rails on it, with high tensile stock net and barbed wire or plain wire. These closeboard panels are very good strong panels and are available at any height up to 6ft. 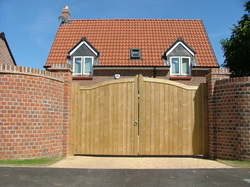 Gates are available in a wide range of material including wood; metal and in bespoke sizes and styles. 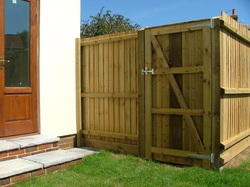 Our popular Close board gates, including galvanised fitteds are priced from just £95.00.